Subaru is growing fast. The brand has seen 78% growth in sales over the past four years, and has over a million fans on Facebook. The company, which has focused strategy on social media, in recent years built a strong brand identity around a theme -- love -- that at first glance seems absurdly vague and sentimental, especially in a sector that sells expensive, engineering-driven things like cars. Love? Maybe for Chanel, but for cars? Yet, it works, says Michael McHale, who heads both corporate communications and social media at the Cherry Hill, N.J., company. After all, he says, owners say that's how they feel about Subaru. At a recent meeting of the International Motor Press Association, he gave a history lesson and explained how the campaign, "Share the Love," has put wind in the sails -- and sales -- of a once-stagnant brand. McHale recounts how the company, on deathwatch in the ’90's, pulled itself out of the ICU with Forrester, Outback, and Legacy, but hit a ceiling because it lacked brand identity. "Driven by What's Inside," launched in 2008, didn't help. "It was too subtle and clever," said McHale. The problem: survey respondents said they had no opinion of Subaru. "They said 'it's not for me,' and that Subaru wasn't relevant to them." But owners "saw us as ready for anything, and progressive, and adventurous. And unless the heart's engaged, you aren't going to buy." Research also showed that the Subaru owner base is three times more likely to hike and bike, three times more likely to be cause-oriented, volunteer-oriented and 3.5 times more likely to own a pet. Which, he said, led to the new, highly emotional brand positioning that also tried to promote Subaru as virtuous and transparent. Ads have real owners talking about their cars, and focus on the brand sponsorship of things like the ASPCA, a rally and performance team, the Geological Society of America, and the science-education foundation AAAS. The brand also tends to eschew traditional marketing tactics and sports. Instead of the Super Bowl, Subaru did a "puppy bowl." It prefers to sponsor things like PBS' "Antique Road Show," and markets around South by Southwest, the Cherry Blossom Festival in Philadelphia, and fall festivals at organic farms, per McHale. He said Subaru's social strategy on places like Foursquare, Facebook, and Pinterest is to engage influencers, podcasters, commentators, opinion leaders, citizen journalists, social-media mavens, bloggers, and forum gurus. 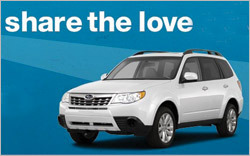 The latest effort was the fifth iteration of "Share the Love" on Facebook, where users could vote to select two charities to join a roster of three organizations -- the American Society for the Prevention of Cruelty to Animals, Make-A-Wish, and the Meals on Wheels Association of America -- that Subaru sponsors. In a yearly fourth-quarter program, Subaru donates $250, up to a total of $5 million, for every new Subaru vehicle sold or leased. "Instead of advertising, we try to provide valuable content."